‘Know that the slaves of Allaah need to worship Allaah alone, without associating any partners with Allaah in their love for Allaah, nor associating any partners in their fear of Him, nor in their hope in Him, nor in their trust upon Him, nor in their actions for Him, nor in their swearing by Him, nor in their taking an oath by Him, nor in their submission to Him or their humility and proclaiming His greatness, nor in their Sajdah (prostration) and attaining closeness to Allaah, none of this is greater, not even the body’s need for its soul nor the eye’s need of light is greater than this need, of worshipping Allah alone without associating any partners with Him. Rather there is no similitude which can be measured against the need to worship Allaah without partners and thus gaining closeness to Allaah. Indeed the actual reality of a slave of Allaah is his heart and his soul which Allah alone is able to rectify, there is none worthy of worship except Him. ‘Nothing repels the extreme worldly hardships as does Tawheed, this is why the supplication for distress and anxiety is with Tawheed. A distressed person does not make Dua with the supplication of Prophet Yunus, except that Allaah drives away his distress and anxiety with Tawheed. There is nothing more gruesome for the distressed person except Shirk and there is nothing that can rescue you from it except Tawheed, it is the place of refuge for the creation, its shelter, its fortress and its means of (seeking) aid. ‘Whoever reflects over the state of the world finds that the means for all rectification on the earth is the Tawheed of Allaah, worshipping Him and obedience to His Messenger. The reasons for all evil in the world, trials, tribulations, droughts, being overpowered by the enemy and other things is opposing Allaah’s Messenger and the invite to other than Allaah and His Messenger. Whoever truly reflects upon this and ponders over the situation of the world since it was established until now and until Allaah inherits the earth and those who are upon it and Allaah is the best of the inheritors, finds this matter specifically in his own self and truly in other than himself generally and specifically. ‘From the greatest means of ease and delight for the heart, is: Tawheed, and depending upon its perfection, its strength and its increase will give delight to the heart of its companion. ‘Every Soorah in the Qur’aan embodies the two types of Tawheed and we will mention a comprehensive statement: Indeed every Ayaah in the Qur’aan comprises Tawheed, testifying to Tawheed and calling to it. The Qur’aan is information about Allaah and His Names, His Characteristics and His actions, so this Tawheed is knowledge based information. Or the Qur’aan calls to His worship Alone, not associating partners with Him, rejecting and casting off everything that is worshipped other than them. So this Tawheed is (Tawheed al-Ebaadah) required by Allaah and intended by the worshippers, and it is also the worship that the worshippers direct to Allaah. Furthermore, the Qur’aan is either commands or prohibitions and adhering to Allaah’s obedience regarding those commands and prohibitions. They are the rights of Tawheed and that which completes Tawheed. Or the Qur’aan is information about Allaah honouring the people of Tawheed and His Obedience and what He did to them in the Dunya and what He will honour them within the Hereafter, which is the reward of His Tawheed. Or it is information about the people of Shirk, what Allaah did to them in the Dunya from exemplary punishment and what befell them and the consequences of punishment, then that is information about what is contrary to Tawheed. 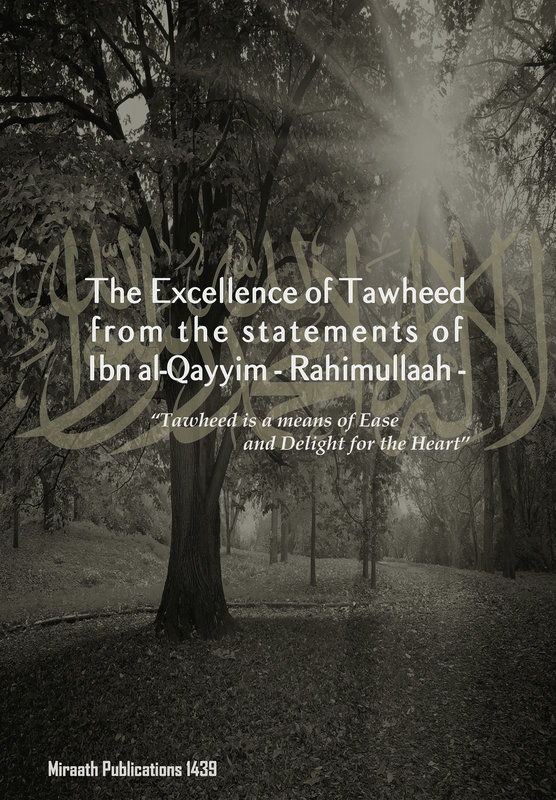 ‘Ikhlaas and Tawheed are a tree in the heart. Its branches are good actions. Its fruits are a good life in this world, and eternal comfort in the Hereafter, and just like in Paradise the fruits whose supply is not cut off, nor are they out of reach, likewise are the fruits of Tawheed and Ikhlaas in this world. ‘Since Shirk is the greatest of the three aspects to Allaah Azza wa Jal then He has prohibited Paradise for the people of Shirk. So the Mushrik will not enter Paradise, rather only the people of Tawheed will enter it, because Tawheed is the key to its door. ” ألا أخبركم بشيء، إذا نزل برجل منكم كرب أو بلاء من بلايا الدنيا دعا به يفرج عنه؟ فقيل له: بلى، فقال: دعاء ذي النون: لا إله إلا أنت سبحانك إني كنت من الظالمين “. ‘Shall I not inform you with a matter, that if a calamity or a trial from the trials of the Duniya befall a person and then he makes Dua with this matter he will be free from that calamity? It was said to him: Of course. The Dua of Yunus : There is none worthy of worship except You, free are You from imperfection and indeed I am from the oppressors.